The original “Cave of the Winds” was a cavern located behind the Bridal Veil Falls. The Bridal Veil Falls is the smaller waterfall located between Luna Island and Goat Island, beside the American Falls. The Cave of the Winds was an overhanging ledge, consisting of Lockport Dolostone rock, at the top portion of the gorge where the waters of the Bridal Veil Falls flowed over. Originally this portion projected more than 30.5 metres. Due to this overhang of rock, a cavern behind the cascading water was formed. This cavern is known as the world famous “Cave of the Winds Attraction”. In 1901, the cavern originally had an approximate volume of 396,240 cubic metres. By 1955, due to erosion, the volume had decreased to approximately 277,368 cubic metres. This cavern was originally discovered by Joseph W. Ingraham, who had spotted the cave from above the gorge. The first two people to walk behind the Bridal Veil Falls into this cavern were Barry Hill White and George Sims. They named it “Aeolus’ Cave”, after the Greek God of the Winds. Later on, Ingraham and supporters, decided to change the name to Cave of the Winds. Until the Biddle Staircase opened in 1829, the only access into the gorge was by the use of a ladder or a rope. By 1879, the Cave of the Winds became so popular that Augustus & Peter Porter began charging $1 per person to visit. The first accident at the Cave of the Winds occurred on Sunday August 2nd 1857. A rock fall happened near the cave. These rocks fell onto a group of tourists at the base of the gorge. George Parsons sustained a fractured skull and hip, Mr. F. Williams sustained a fractured arm and the son of Mr. Joseph Haney sustained a fractured leg. The second accident occurred on September 6th 1920. Rock suddenly fell from the ceiling of the cavern and killed three people, as well as injuring a number of others. In 1925, elevators were installed to provide efficient transportation from above the gorge to the bottom of the cave. The Cave of the Winds, which had always been popular, became a major attraction at Niagara Falls. Unfortunately nature, who had created the attraction thousands of years ago, were also responsible for its destruction through water erosion. Major rock falls at Prospect Point and Terrapin Point had showed the danger of loose rock along the face of the gorge. This led to the decision, determined by engineers, that the entrance to the cave was too dangerous because the ledge which had blocked the water was at risk of collapsing. In 1955 the final agreement on the future of the cave was made and it was destroyed by a controlled dynamite blast. Today the new Cave of the Winds attraction is located on Goat Island within Niagara Reservation State Park in Niagara Falls, New York. 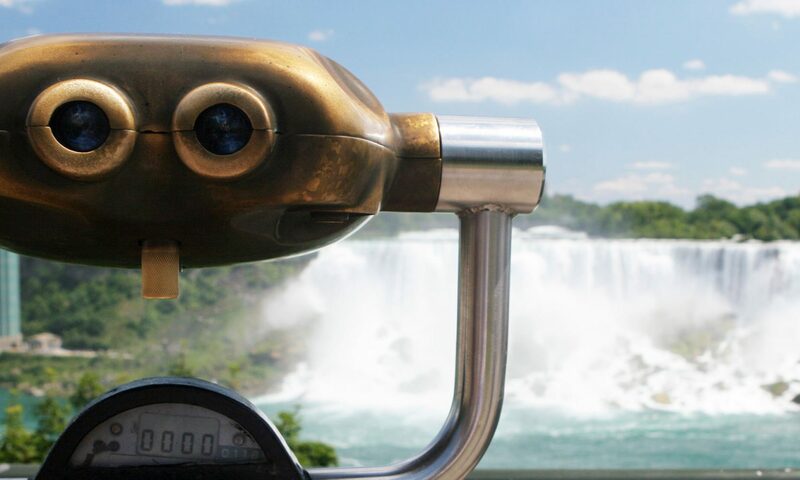 A guide leads tourists on an exhilarating adventure to the base of the Niagara Gorge. Tourists then travel over a series of wooden decks below the Bridal Veil/Luna Falls coming within 7.6 metres from the Falls. From the hurricane deck guests can feel the force of the Falls and the wind combine.